For American trains you'll be looking at 1:24, or G Scale. Though it would look equally as good alongside a 1:19 16mm scale trains.despite been an American scoop. The early drawings are coming along nicely Chris. I got to thinking about the operation of this "bad boy" and was wondering if you happen to know how large of a crew it took to run it? Hi Chris, Looks to be an interesting project with the research etc. As to the scale question, I am presuming you are keeping true to steam operation(? ), thus the question might not be the overall dimensioning but practical dimensioning of operating components and what your manufacturing capacity is. There are plenty of G1 railroad cranes of similar type,some scratch built, but I have not seen any steam operated jobs other than 5'' gauge or bigger. Maybe a similar general sizing that complements your Shay and Lombard would just about be big enough for steam operation?? Interested to hear your thoughts as to how far down in size you think is viable for an operable steamer. Regards Paul Gough. This looks like it will be really fun to watch. I'm glad you have access to the 12" to 1' model to get measurements. Are you sure that the whole beast is there? I definitely want to have the engines operable, so that will be a factor on scale chosen. Getting a boiler that small to generate enough steam for four twin engines may not be practical, may be set up just for compressed air if not. Final choice on scale won't happen for a while yet! All the machinery is there, though small brass fittings were stolen years ago. Repairs were made during its life, wood siding was changed to steel, sliding doors changed to hinged. The main chains were welded to the pulleys and the extra on the drums was removed when it was abandoned. The control levers are still there. Lots of rust and dirt has been added! I have seen descriptions of up to 8 men to run, for controls and boiler crew. Hi Chris, another great project I will be following along. It depends on exactly how it operates, but the small boiler may not be too much of a problem (within reason), as I think the engines may normally operate only one at a time. Perhaps driving and steering though it might even stop for steering. It would not be a high speed machine. Similarly the boom operations might be planned to be one at a time, and intermittant to a degree, so giving the boiler time to catch up. Though might have some little continuous bleeds to clear condensate from the idle engines. It's a good point, most steam cranes generally operate on a basis of having twin cylinders, and dog and clutch drives, through gears to the winding drums. How is the setup organised inside? 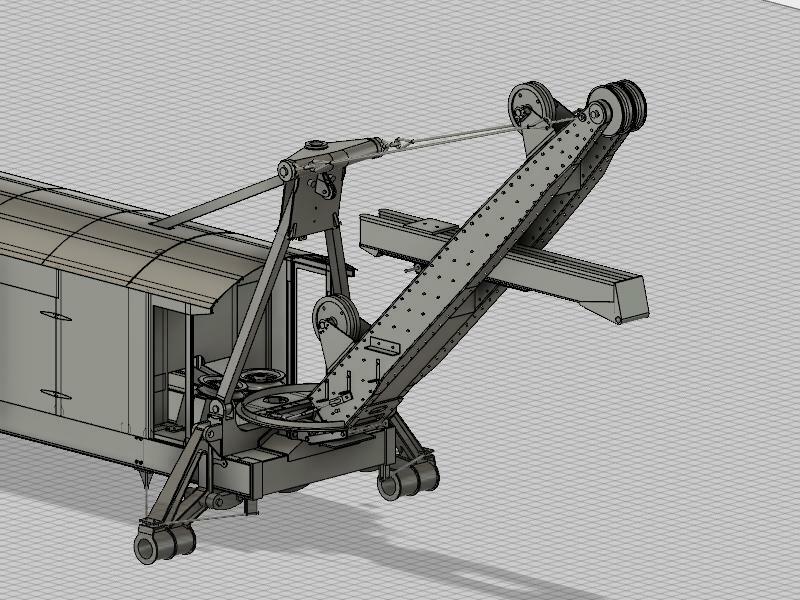 A small boiler operating at 40-60psi and internally gas fired, would probably be sufficient to operate the boom, even lifting heavier loads. It's about getting the internals to quickly transfer the heat to the boiler. Actually the hoist engine, the largest, would be running fairly constantly, engaging the clutch on the bucket as needed, while the swing and dipper boom engines came on and off and reversed frequently. The bucket lowered by clutch and brake under its own weight. Pretty much all the time at least two would run at once during active digging, at least with a skilled operator. The tracks ran off another clutch on the hoist engine, and the steering was its own separate engine added when the tracks replaced the rail trucks. Today's update: started on the dipper boom. Main shape is done, need to add more details (bolts/etc). Position on the main boom is approximate, will finalize when the larger gears that run it in and out are made. Also, realized that I had made the upper sheave on the main boom a single, it needs to be a double, and the other sheave near it had to be moved to the side, so that the chains to the bucket can form a double fall. Think I may need a 50lb sack if popcorn for this one Chris. Looking good on paper so far though. You must have a BIG microwave for that much popcorn!! I just heard from the historical society, the visit from the park service guys from Steamtown has been moved back a week to mid November, so one more week to get the rest of the 3d model in shape before then. The fine details of the engines, drums, clutches, and tracks will have to wait until I get in for my own photos and measurements since the ones I got from other sources don't have any close up shots of them. Still lots I can get done till then. I am going to be taking a side trip this week to design up a modification to the log advance ratchet mechanism for the water driven sawmill at the museum in Maine. They want to cut the advance distance in half to reduce the stress on the blade, and were going to rework the gears till I pointed out that adding a second set of pawls half a tooth over would mean only having to change a pivot point on the lever. Measurements are coming tomorrow, and I will be drawing the new setup in Fusion for them. Cool project Chris. I'll be watching. I'm keeping my fingers crossed that the Park Service and Historical Society realizes the opportunity that's being placed in their laps. Bad Behavior has blocked 16011 access attempts in the last 7 days.